The Atal Pension Yojana (APY) scheme, got launched on May 9, 2015, by PM Narendra Modi at Kolkata. The aim of the scheme is to addresses the old age income security of the working poor and is focused on encouraging and enabling them to join the National Pension System (NPS). PM Narendra Modi, along with Atal Pension Yojana (APY), he will launched two insurance schemes – Pradhan Mantri Jeevan Jyoti Bima Yojana and Pradhan Mantri Suraksha Bima Yojana. The Government announced the introduction of universal social security schemes in the Insurance and Pension sectors for all Indians, specially the poor and the under-privileged, in the Budget for the year 2015-16. 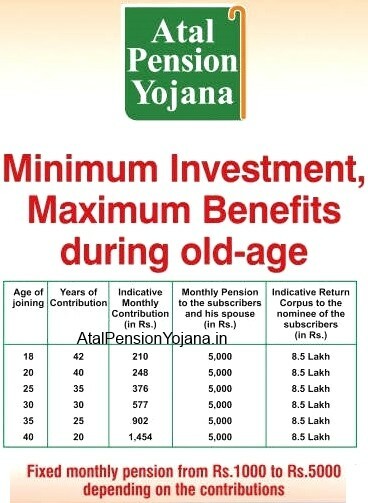 Therefore, it has been announced that the Government will launch the Atal Pension Yojana (APY), which will provide a defined pension, depending on the contribution, and its period. The APY will be focussed on all citizens in the unorganised sector, who join the National Pension System (NPS) administered by the Pension Fund Regulatory and Development Authority (PFRDA). Under the APY, the subscribers would receive the fixed minimum pension of Rs. 1000 per month, Rs. 2000 per month, Rs. 3000 per month, Rs. 4000 per month, Rs. 5000 per month, at the age of 60 years, depending on their contributions, which itself would be based on the age of joining the APY. The minimum age of joining APY is 18 years and maximum age is 40 years. Therefore, minimum period of contribution by any subscriber under APY would be 20 years or more. The benefit of fixed minimum pension would be guaranteed by the Government. The APY would be introduced from 1st June, 2015. How i can change nominee detail on my APY account. Can I withdraw the amount After 3(three) years with interest. I am a Usa citizen can I join? How to get PRAN in APY? I have subscribed to APY and from the last 3 year amount is dedcuting from the account but I don’t have any login information, after reading the blogs in internet it asking for PRAN no but I don’t have. for this I called the customer care and also register do online compliane but nothing is happens till today.